SCOTTSDALE, Ariz. – June 30, 2016 – Barrett-Jackson, The World’s Greatest Collector Car Auctions®, helped raise $605,000 for charities that support U.S. veterans and their families, youth programs and medical research during its Northeast Auction, June 23-25, 2016, at Mohegan Sun. To date, Barrett-Jackson has helped raise over $90 million for charity. 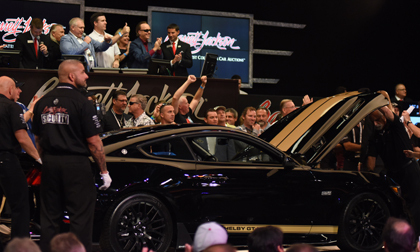 Aaron Shelby, grandson of the late Carroll Shelby and longtime fan and supporter of Barrett-Jackson, drove the 2016 Shelby GT-H Mustang concept/prototype (Lot #3003) onto the block. The 50th Anniversary Edition vehicle raised $150,000 with proceeds benefiting the Carroll Shelby Foundation. All-Pro tight end Greg Olsen joined the Barrett-Jackson team on the block on Thursday to help sell his 1969 Chevrolet Camaro Custom Convertible (Lot #3000). One hundred percent of the $100,000 hammer price benefited Receptions for Research: The Greg Olsen Foundation benefiting The HEARTest Yard. On Saturday, country music artist Zac Brown and his wife Shelly auctioned a 2015 Jeep Wrangler Unlimited Custom SUV (Lot #3005) for $120,000 with 100 percent of hammer price benefiting Camp Southern Ground in Georgia. For full results of the event, follow the link to Barrett-Jackson.com. Established in 1971 and headquartered in Scottsdale, Arizona, Barrett-Jackson, The World’sGreatest Collector Car Auctions®, is the leader in collector car auctions and automotive lifestyle events. The company produces auctions in Scottsdale, Arizona; Palm Beach, Florida; at Mohegan Sun in Connecticut, and Las Vegas, Nevada. With broadcast partners, Velocity and Discovery Channel, Barrett-Jackson will feature live television coverage in 2016, including broadcasts in over 100 countries internationally. Barrett-Jackson also endorses a one-of-a-kind collector car insurance for collector vehicles and other valued belongings. For more information about Barrett-Jackson, visit http://www.barrett-jackson.com,or call 480-421-6694.